Tis the season for all things pumpkin. Since I love my Healthier Baked Pumpkin Doughnuts so much, I thought it would be fun to try it with a chocolate twist. 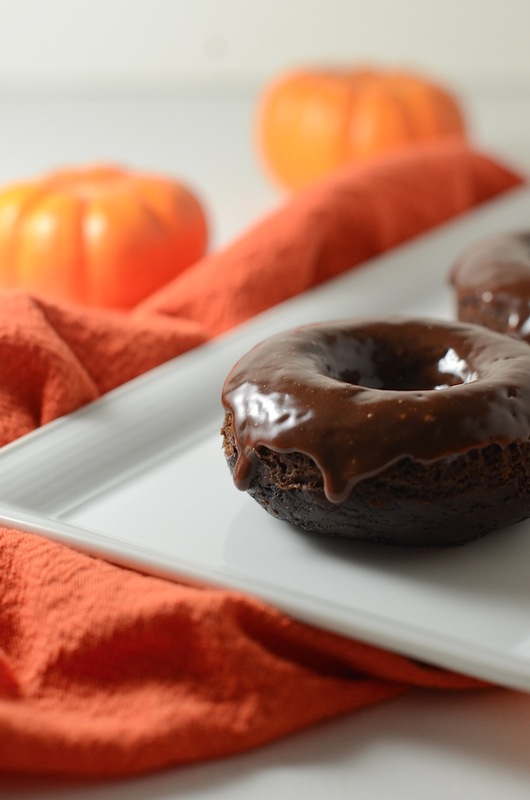 I present a Healthier Chocolate Pumpkin Doughnuts Recipe with Chocolate Glaze. This recipe is also baked like the non-pumpkin version. Normally, I like to roll my baked doughnuts in a cinnamon sugar mixture. Because I’m lazy like that. When you can have dessert in under 20 minutes, the extra few minutes it takes to make the glaze can add up. 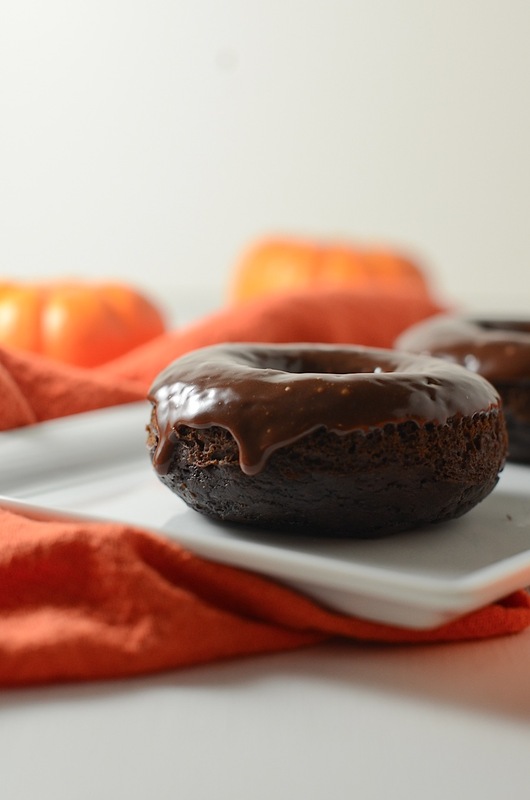 So, if you’re looking to shave off a couple minutes from this recipe, these Healthier (baked) Chocolate Pumpkin Doughnuts would also be delicious rolled in cinnamon sugar. If you’re looking for as much chocolate-y goodness as possible, then definitely set aside a couple extra minutes to whip up the chocolate glaze recipe. 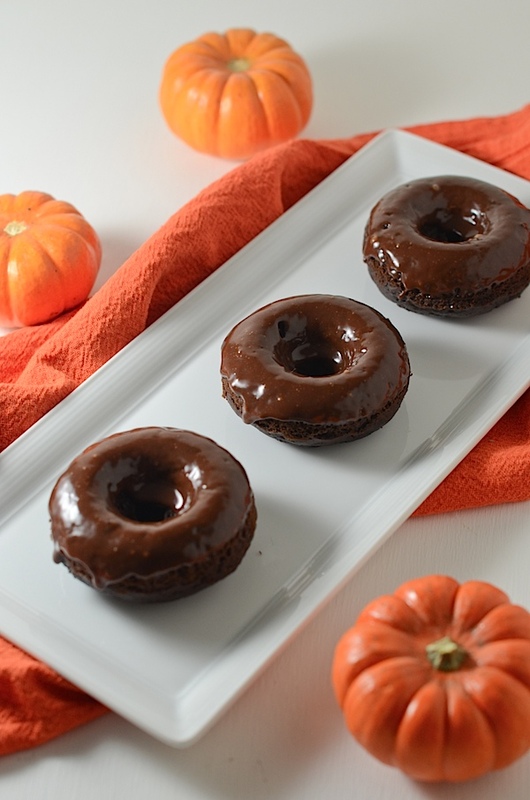 To make these Healthier Chocolate Pumpkin Doughnuts extra beautiful, add some orange or Halloween-themed sprinkles on top! 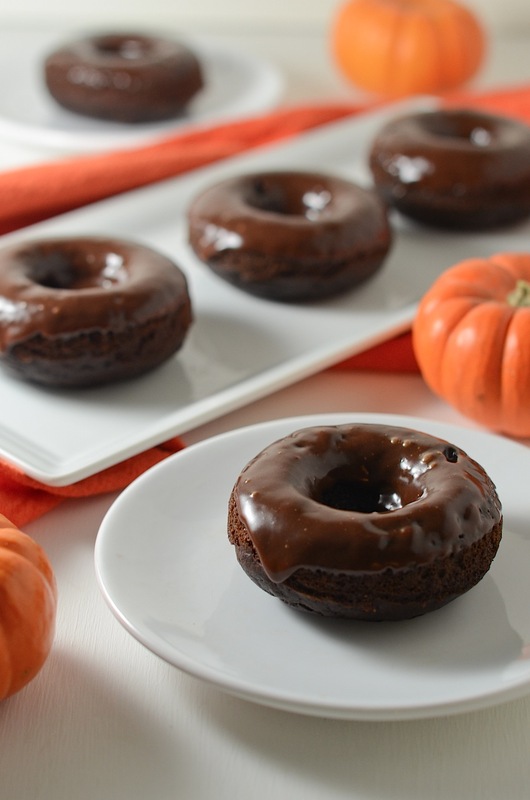 It was difficult to not eat all six of these Healthier Chocolate Pumpkin Doughnuts. But, I managed to share them with hubby and save one for the next day. It was pretty good cold, straight out of the fridge. But, I think they’re best when they’re eaten with that fresh-baked warmth still in them. Mmm! 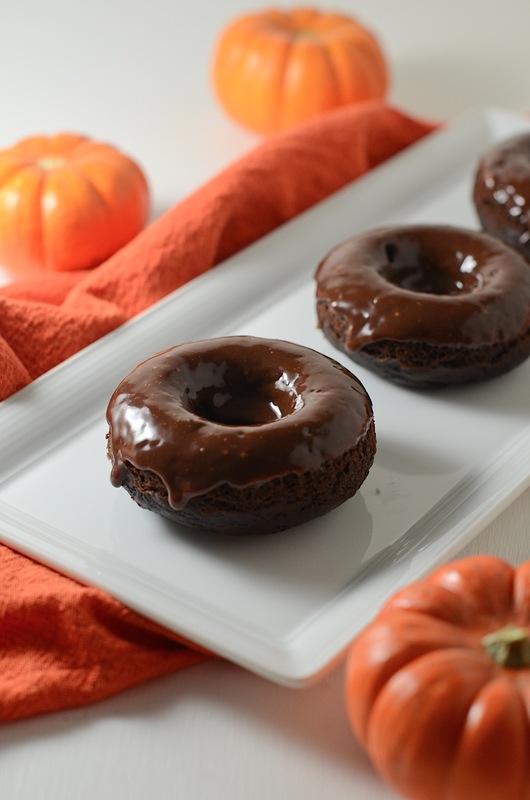 Here’s a quick & easy dessert that’s a perfect use of leftover canned pumpkin – Healthier Chocolate Pumpkin Doughnuts Recipe with Chocolate Glaze. I’m loving baked doughnuts because I can make them so quickly and they’re just so darned good. One batch never lasts long in our house. We gobble them right up and you can, too, with this recipe. Pre-heat oven to 375 degrees F. Spray 6-count doughnut pan with non-stick spray. In a medium-large bowl, add flour, cocoa powder, sugar, baking powder, baking soda, cinnamon, and salt. Whisk to combine. In another medium-large bowl, whisk together pumpkin and milk. Whisk in egg. Add vanilla extract and white vinegar and whisk to combine. Pour wet ingredients into dry ingredients and gently mix until just combined (careful to not over-mix). Evenly distribute in doughnut pan. Note: This dough is pretty thick, so you’ll want to spread the tops as flat as possible using the back of a spoon or spatula. Make the chocolate glaze (recipe follows). When doughnuts are safe to touch, but while they’re still warm, dip the smooth side (bottom) into the chocolate glaze. Place butter and milk in a medium microwave safe bowl. Heat until butter is almost melted, about 20-30 seconds. Add chocolate chips, let sit for a minute and then whisk until the chocolate chips are melted and the mixture is combined. Whisk in vanilla extract. Whisk in powdered sugar until evenly combined. Note: You can use cinnamon sugar instead of the chocolate glaze if you want to save some time or prefer the different flavor/topping. Stir 1/4 cup granulated sugar with 1/2 teaspoon ground cinnamon with a fork and dip warm doughnuts into the sugar mixture. Be sure to check out my Healthier Baked Pumpkin Doughnuts and Healthier Baked Apple Cider Doughnuts. Hope you enjoy this baked Healthier Chocolate Pumpkin Doughnuts Recipe with Chocolate Glaze! By the way, what is your favorite brand of canned pumpkin? Though I prefer using organic canned pumpkin, I must say Libby’s is probably the best. Libby’s canned pumpkin is not only a beautiful, vibrant orange color, it has a great texture and flavor, too! I really wanna try this recipe, it looks utterly divine! But I just have a quick question, for the sugar you put 1/4 cup plus 1/4 cup. Does that mean a 1/2 cup of sugar? You also did this for the cinnamon. Is it 1/2 tsp of cinnamon or 1 tsp of cinnamon? This looks delicious. I will try for an upcoming birthday. Will it work as a cupcake? I’ll let you know! Step 2 has left out the cocoa powder to be added with the flour, but I picked it up. The chocolate part! Thank you. These look delicious and would love to try them but quick question, under the 1/4 teaspoon of baking soda you have listed 1/2 teaspoon of…… there’s nothing there. Just wondering if it’s a typo or something is missing. Thanks! Hi Vanessa! Good catch…I was missing 1/2 teaspoon of cinnamon! 🙂 Thank you for letting me know. Hope you enjoy the recipe if you try it.